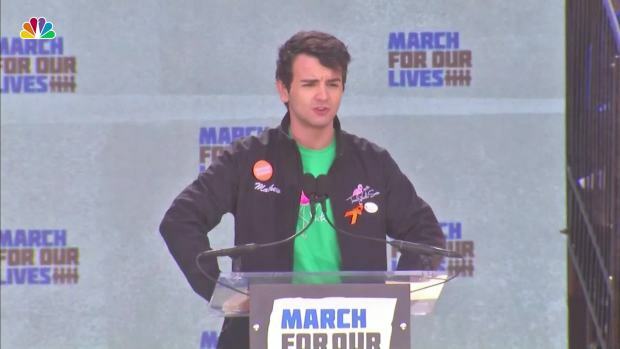 Matthew Soto, 19, brother of Newtown Elementary victim Victoria Soto, spoke at the DC rally about his sister’s death and how things should’ve changed after that. When Matthew Soto was 15 years old, he sat in his high school Spanish class while his older sister, Victoria Soto, was slaughtered in her first-grade classroom in Sandy Hook Elementary School, Soto told the "March of Our Lives" rally in Washington, D.C., on Saturday. Victoria Soto was a teacher at the elementary school on Dec. 14, 2012, when she was planning to make gingerbread houses with her students before the holiday break. Soto was among the speakers from Newtown to take the stage at the rally organized by students from Parkland, Florida, where on Valentine’s Day, 17 of their schoolmates students were shot to death by another gunman. The Sandy Hook shooter, 20-year-old Adam Lanza of Newtown, killed first his mother and then 20 first-graders and six adults at the elementary school before turning a gun on himself. Soto saved some of the children in her class, hiding them while she tried to divert Lanza. More than 400 students, teachers and parents from Newtown marched on Saturday in Washington, D.C., Soto said, and they presented a banner to the Parkland community. Tommy Murray was a sixth-grader in Newtown, on lock-down for hours, when Lanza attacked. Among the victims was Murray’s former principal, Dawn Hochsprung. A third Newtown student, Jackson Mittleman, told the Parkland survivors that they would stand by them as they healed, long after the media trucks had left. “We are forever connected by a tragedy that could have been prevented if our lawmakers had the courage to enact smart gun legislations,” Mittleman said.